Ron and his wife, Mildred, reside in Virginia Beach, Virginia. He loves living the writing life on the shore of the Chesapeake Bay, where he is inspired by the rich history and natural beauty of the Hampton Roads area. McManus is a member of the Hampton Roads Writers and South Carolina Writers Workshop. His debut work, Libido’s Twist, a medical suspense novel, won a Writer’s Digest award. McManus’s debut work, Libido’s Twist, a medical suspense novel, won a Writer’s Digest award in genre fiction. 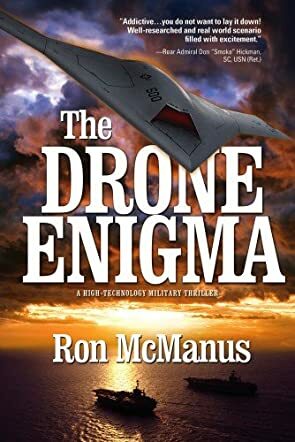 His second, The Drone Enigma, a military thriller, was published in December 2013 by Koehler Books. A former naval officer, he was global vice president of R&D quality and regulatory compliance for GlaxoSmithKline and lived and worked in London for several years. Prior to entering the pharmaceutical industry, he was director of Program Integrity at the North Carolina Medical Peer Review Foundation, where he established the state’s first Medicaid fraud investigation unit. When a young, healthy employee of LTG, a defense contractor for the US Navy’s drone development program, dies suddenly from an overdose of a dangerous chemical, Jake Palmer is called in to investigate. Jake, an ex-Navy Seal turned private investigator, is reunited with an old Seal buddy and a woman he dated in college, making this assignment different for him than most, but he is certain he can get to the bottom of the mystery in just a few days. Unfortunately, the theft of a laptop and the murder of his former Seal friend, along with a chance encounter with Alona Green, a beautiful corporate spy, complicate Jake’s investigation and make the situation uncomfortably personal. Injected into the chaos of an investigation that appears to be getting out of hand is a terrorist plot, concocted by a dangerous member of the Taliban in Afghanistan, being hatched against the drone program itself. When all of these elements begin to collide, the action begins. The plot of The Drone Enigma moves quickly and always in one direction. Its author, Ron McManus (no relation to this reviewer), continuously builds the tension by the unpredictable, but quite believable, plot twists and turns. The dialogue he skillfully presents is often witty and always crisp and to the point. His characters, especially Jake and Alona are well defined. Their relationship makes me believe that we will see them together in future works. I would recommend this book to readers who like action and adventure and a frighteningly believable plot.